Pursuant to an order emanating from Capt. James Smith, Provost Marshall of the Fourth District of Maryland, the slaves of Washington County have been enrolled. 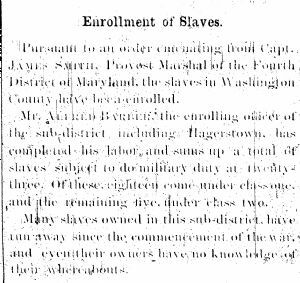 Mr. Alfred Barber, the enrolling officer of the subdistrict included Hagerstown has completed his labor and sums up a total of slaves subject to do military duty at twenty three. Of these eighteen come under class one and the remaining five under class two. Many slaves owned in this sub-district have run away since the commencement of the war and even their owners have no idea of their whereabouts.